A parliamentary report of 1777 recorded parish workhouses in operation in Hambleden, (for up to 60 inmates), Marlow (162), Little Missenden (10), Princes Risborough (50), Chepping Wycomb (90), Chipping Wycomb (80), and West Wycomb (44). 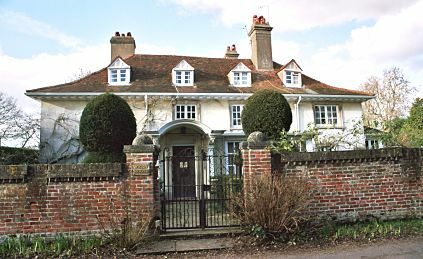 A house on Bassetsbury Lane once served as the High Wycombe (Chipping Wycombe) parish workhouse. High Wycombe former parish workhouse, Bassetsbury Lane, 2003. A parish workhouse, apparently purpose-built, was erected at Bledlow sometime around 1800. The large U-shaped building could hold around 180 inmates. 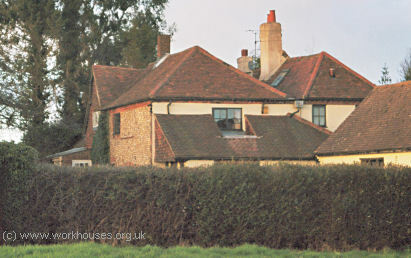 Bledlow former parish workhouse from the west, 2000. Great Marlow had a workhouse in late eighteenth century building, now four houses, on Munday Dean Lane. 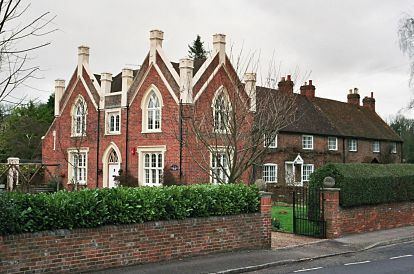 Great Marlow former parish workhouse, Munday Dean Lane, 2003. In around 1780, a building was erected on Fern Lane in Little Marlow which served as a work-house and lace factory. 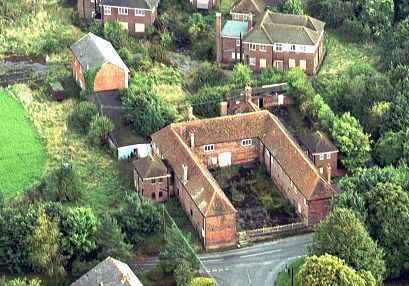 Little Marlow former parish workhouse, Fern Lane, 2003. 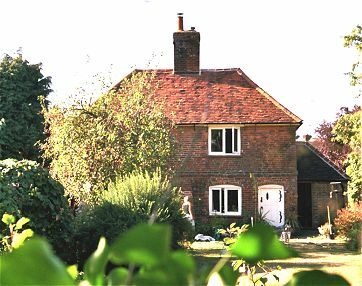 A pair of cottages at Holmer Green, Little Missenden, dating from around 1704, was at one time used as the local parish workhouse. Little Missenden former parish workhouse, Holmer Green, 2003. 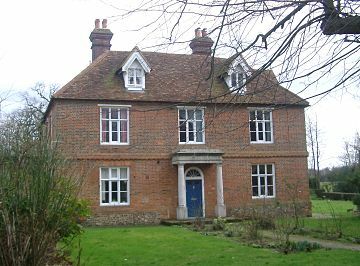 In Hughenden, a house erected in 1761 on Hunts Hill Lane once served as the parish workhouse. Hughenden former parish workhouse, Hunts Hill Lane, 2003. West Wycombe had a parish workhouse at Wheeler End. Wheeler End former parish workhouse, 2003. County of Buckingham: Bledlow with Bledlow Ridge, Bradenham, Ellesborough, Fawley, Fingest, Hambledon, Great Hampden, Little Hampden, Hedsor with Lillifee, Horsenden, Hughenden, Little Hampden, Ilmer, Great Kimble, Little Kimble, Great Marlow (3), Little Marlow, Little Missenden, Medmenham, Monk's Risborough, Prince's Risborough (2), Radnage, Saunderton, Stoke Mandeville, Turville, Wendover (2), Wooburn (2), Wycombe (2), Chipping Wycombe or High Wycombe (2), West Wycombe(2). County of Oxford: Chinnor, Stokenchurch. Counties of Buckingham and Oxford: Ibstone. Later Additions: Lewknor Uphill (from 1885). The population falling within the Union at the 1831 census had been 33,947 with parishes ranging in size from Horsendon (population 37) to Great Marlow (4,237) and Wycombe itself (3,198). The average annual poor-rate expenditure for the period 1831-34 had been £30,016 or 17s.8d. per head. The Wycombe Board of Guardians had their first meeting on 27th May 1836. Amongst their other business, they appointed a Committee to investigate the possibility of adopting a single workhouse for the union. 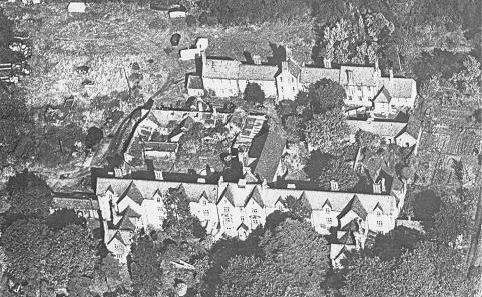 On June 3rd, the Committee reported that the existing parish workhouse at Bledlow could accommodate 180 inmates, and that at Marlow 200 old, infirm and infants. There were 230 inmates currently in residence at the two sites combined. It was estimated that the annual saving in moving to a single establishment would only be £250 a year. The Poor Law Commissioners' architect Sampson Kempthorne had reported that the enlargement of Bledlow would cost £2,500 to £3,000, while that of Marlow would cost about £450 more. Various permutations were debated for housing the able bodied poor in one workhouse and the old, infirm and infants in the other. The Committee eventually recommended the retention of a single enlarged workhouse at Bledlow. However, an Extraordinary General Meeting of the Board of Guardians on June 17th resolved that both workhouses should continue in operation until at least March 1837. In 1836, the Poor Law Commissioners authorised an expenditure of £1,209.7s. for alteration and enlargement work of existing buildings. Nothing further appears to have been decided in March, 1837, and both workhouses continued in operation. On 28th March 1840, the Bucks Herald published a letter signed 'Junius' describing Wycombe as the 'worst managed union in the kingdom'. With two miserable workhouses, scarcely large enough for the purpose of a moderate sized town, the Board niggardly chooses to flounder on. At Marlow Workhouse, the worst of the two, with a Governor at a hundred a year and maintenance for a large family — a Schoolmistress who leaves her pupils on a Sunday, not attending them to Church, because the Board do not like to coerce her conscience, she being a Dissenter, with a salary estimated at forty pounds. With all this expense, here is jumbled together upwards of two hundred persons, without classification, consisting of equal proportions of men, women, boys, and girls. The boys live amongst the men, and the girls with the women. Here the youthful mind is trained by the vicious example of women and men of the worst character, the former class chiefly consisting of those who arc compelled to seek a refuge here because of their inability to support their illegitimate offspring. Here typhus, itch, measles, and scald head defy the skill of the physician, because there exists no means of separating the sick from the healthy — the consequence is a dreadful mortality. Two children were buried last week! three the week before!! and three the week before that!!! Paupers are frequently seen from the Workhouse, in the town of Marlow, associating with equivocal characters out of doors, at other times entering the pawn shops, or a beer house, and all this is called management. But need we wonder, this sapient Board object to appoint a Chaplain to their Workhouse, considering that the Governors are a sufficient substitute. At Bledlow the Workhouse for the aged is rather better managed, but under circumstances very little better than at Marlow. On looking at the visitors' books for these two houses, we find that the principal inspection is under the immediate Guardians of the two localities, but that theirs, like "angels visits, are few and very far between." I trust that the proprietors of property throughout this Union will bestir themselves in the present election, or they may find, too late, the best interests of their poor neglected, and their estates involved by an increasing demand for rates, and a perpetuation of system unparalleled in the history of this country. March II, 1840. JUNIUS. Three weeks later, the paper published a response from an unnamed member of the Wycombe board of guardians, rebutting most of the allegations. The Guardians had a change of heart regrading workhouse provision and in 1843 a new workhouse was erected at a site near Saunderton. It was designed by George Gilbert Scott and William Bonython Moffatt who were the architects of many other workhouses, including nearby ones at Amersham and Windsor. The Saunderton workhouse site location and layout are shown on the 1897 map below. Unlike most of the earlier workhouse designs, the building had a T-shaped main block. At the centre would probably have been the Master's quarters, board-room, and offices. Males were placed in one wing and females in the other. In the central wing to the rear of the centre were the kitchen and the dining hall which also served as a chapel. 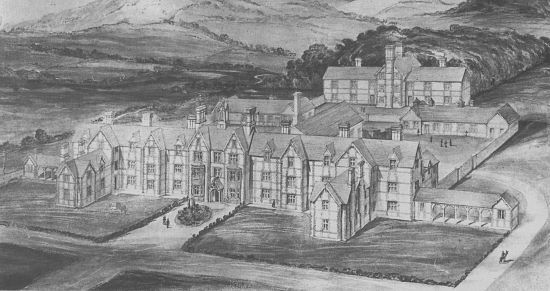 Wycombe workhouse architect's drawing 1842. An infirmary was located at the north of the main workhouse. Again, this had male and female wings. It was later extended at each side as can be seen from the 1950s aerial view below. 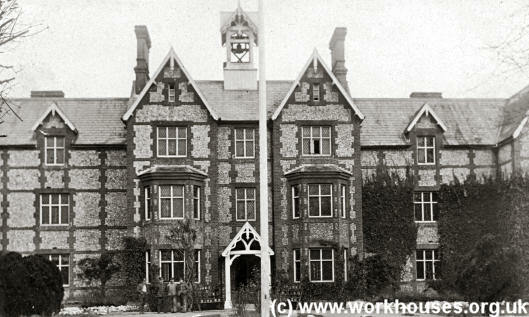 During the First World War, the workhouse was taken over by the military authorities. The picture below shows several men in uniform standing in front the building. After the war, the Wycombe Guardians decided not to re-open the workhouse and in 1920 a scheme was proposed to sell the building to the High Wycombe town council for conversion into forty flats. In 1926, it was reported that eighty applications had been received for the flats although whether any ever moved in is unclear. From 1934 to 1937, part of the building — "the back block, consisting of a large hall, an office and three dormitories" — was employed as a youth hostel. Ownership of the building was then in the hands of the Searl family and it was used to house families during the Second World War and for some time afterwards. By 2001, the former workhouse buildings had all been demolished except for one small white block. The Clare Charity Centre now occupies the present-day premises on the site. 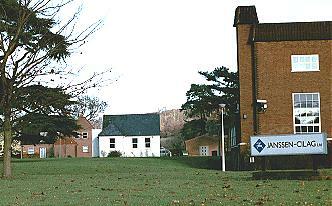 Wycombe former workhouse site, 2000. 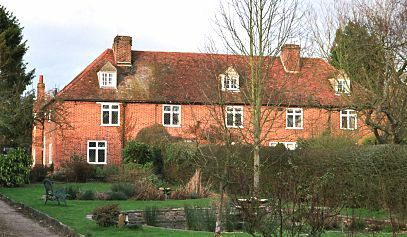 The former Bledlow workhouse was converted for use as the Wycombe Union's residential school and was used to accommodate pauper children away from the main workhouse. Its location and layout are shown on the 1897 map below. 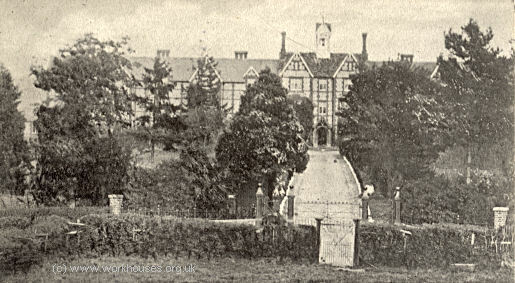 Wycombe Union school site, 1897. At the time of the 1881 census, the school had a resident staff of three — the Master and Matron were brother and sister George and Rebecca Roberts, assisted by school-mistress Hannah Mitchele. There were 57 pupils aged between 5 and 15. A few of these children appear to have had parents in the main workhouse but most did not. Wycombe Union School aerial view from the north-west, 2001. After standing empty and increasingly derelict for many years, the building was destroyed by fire in December 2010. Centre for Buckinghamshire Studies, County Hall, Walton Street, Aylesbury, Bucks HP20 1UU. Relatively few records survive — holdings include: Guardians' minute books (1836-9, 1854-6, 1881-7, 1903-30); Workhouse baptisms (1853-1917); etc. Many thanks to Marion Fryer for pictures of Wycombe.